Does the beat go on? 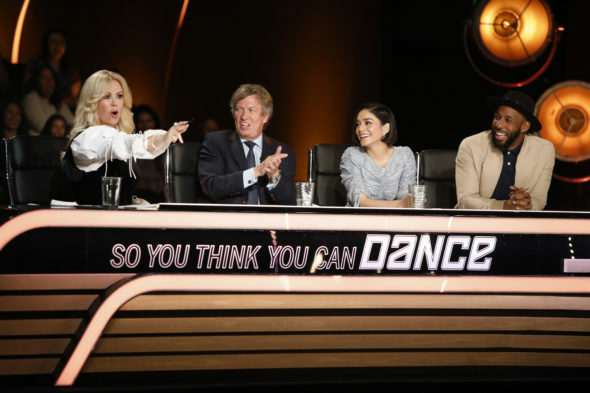 Has the So You Think You Can Dance TV show been cancelled or renewed for a 16th season on FOX? The television vulture is watching for the latest cancellation and renewal news, so this page is the place to track the status of So You Think You Can Dance, season 16. Bookmark it, or subscribe for the latest updates. Remember, the television vulture is watching your shows. Are you? A FOX dance competition reality TV series, hosted by Cat Deeley, So You Think You Can Dance pits dancers against one another, in a bid to become “America’s Favorite Dancer.” Judges Nigel Lythgoe, Mary Murphy, and Vanessa Hudgens asses the contestants’ ability in various dance styles, including contemporary, tap, hip-hop, ballroom, animation, breaking, and more. The top dancers then pair up with All-Stars who will guide them throughout the competition. The 15th season of So You Think You Can Dance on FOX averaged a 0.62 rating in the 18-49 demographic and 2.70 million viewers. Compared to season 14, that’s down by 10% and up by 1%, respectively. Find out how So You Think You Can Dance stacks up against the other FOX TV shows. So You Think You Can Dance has been renewed for a 16th season which will debut June 10, 2019. Stay tuned for further updates. Will FOX cancel or renew So You Think You Can Dance for season 16? This show has been on the bubble for the past few seasons. The ratings are on par with last season so I believe Nigel and company will be renewed but it could be time to give this show a rest. I’ll update this page with breaking developments. Subscribe for free So You Think You Can Dance cancellation and renewal alerts. 1/14/19 update: FOX has renewed So You Think You Can Dance for a 16th season. Details here. TV show ratings are still important. Follow the So You Think You Can Dance weekly ups and downs. What do you think? Are you glad that the So You Think You Can Dance TV show has been renewed for a 16th season? How would you feel if FOX had cancelled this TV series, instead? I love this show and I look forward to watching it every summer! However, I didn’t watch it the season with the children. I thought that was a huge mistake! Last season was cut in half. It only lasted half the time and was only on for one hour instead of two like every other season. I was so bummed, but thankful it was still on. I can’t wait until June! I love this show–it is my favorite show on tv. It is the only show I ever watch on FOX and if it isn’t renewed, I won’t watch anything on FOX. I’ve enjoyed all the shows iterations (except the young dancers–the kids). I hope it is renewed. If it is, you bet I’ll be watching. I love this show.Great dancers from all around. Just don’t bring back Vanessa Hudgens, she adds nothing to the show.She’s only there for the young people and the fashion. She does not know how to comment on the dancers, other than repeating what has already been said. Replace her and ratings will go up. I sure hope so. This show makes me happy, and always has. I’d more people would watch, they would see how uplifting and amazing the show is. I really hope it is renewed. Great dancers from all parts of the world.Puts dancing with the stars to shame. Just don’t bring back Vanessa Hudgens, she adds nothing to the show. Cancel, it is only garbage.